Wellington: What do we want? How do we get there? Tuesday 25 October 2012 at Victoria University of Wellington (Rutherford). 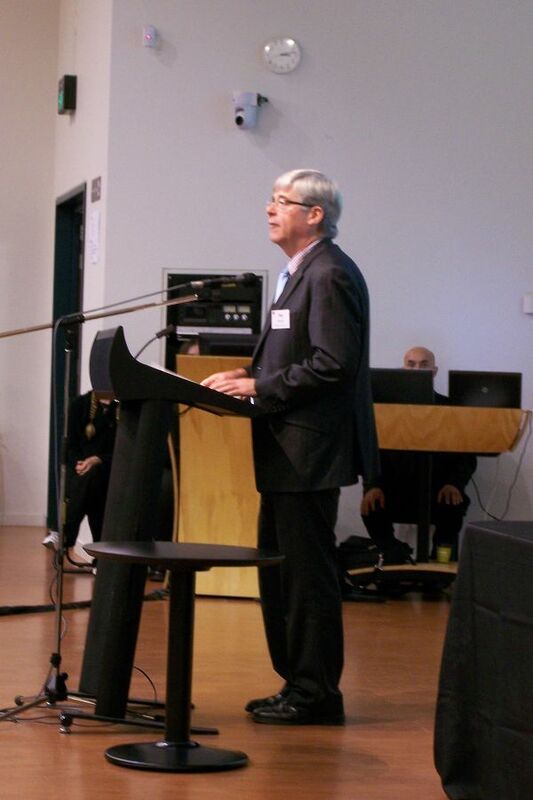 The Rotary Club of Wellington and Victoria University staged the second Rotary Forum with 150 people exploring the options for the kind of Wellington in which they want to live and work. 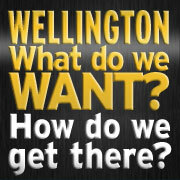 Wellington; what do we want? 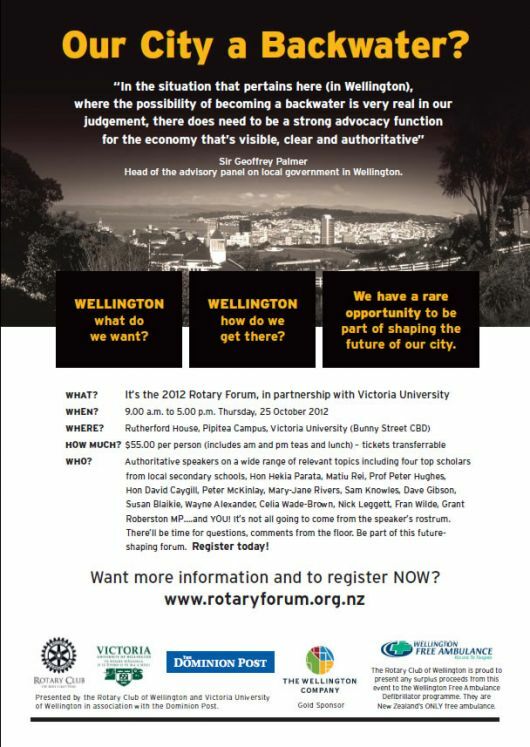 one day Rotary Forum was held at the university's Wellington Pipitea Campus. Now in its second successful year, this highly topical community forum asked; what kind of city and region do we want? 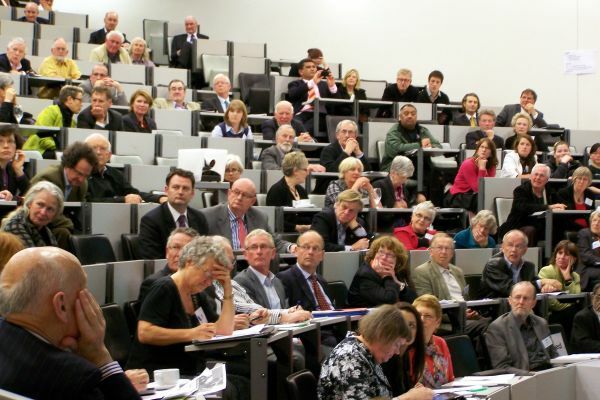 How should community views be expressed in local government? What are the initiatives by business and communities that will help Wellington become the place we want to live and work in? What can you do to influence it? Purpose of the Forum - to bring together experts, thinkers, leaders and people who can make a difference in building the kind of Wellington in which people want to live and work. The Forum was designed, and the speakers selected, to inform and stimulate debate on Wellington’s future by thought leaders, and to give the opportunity for discussion and expression of views that may influence community leaders and decision-making. The Forum was about taking a broad view of the kind of community we want, so that whatever results from the current debate on the purpose and structure of local government can be used to serve those goals. What is the nature of the city and region that we want to live in? What are the initiatives by communities and iwi and business that will help us to become the Wellington in which we want to live and work in the future? It is more than a debate about the boundaries of our cities and region. It is about what a successful Wellington looks like, what our governance arrangements should deliver, and how we get them to work best for our future. We think that there are important issues that are being lost in the debate onstructure and that it is timely to discuss those issues now while the other discussion plays out in parallel. The local governance structure (whatever that might be) should help us to deliver on these aspirations, and we need to convey what we want from it. The discussion is also about what we, in our various roles, should do to shape the Wellington in which we want to live and work? Please see the programme and speakers down the right column and, where provided, links to the presentations. Discussions of community development and structure can be informed by a substantial body of knowledge and recognised frameworks. This session is designed to ground the rest of the day in what is known about enhancing local community leadership, governance and resilience – internationally and in New Zealand. Session #2: Who Makes the Decisions About What Kind of Community We Get? The second session covered experiences in other parts of New Zealand. What happens to communities when central government changes the rules for local governance? How have communities responded? What can Wellington learn about what has happened in Auckland, in Canterbury and after Treaty settlements? This session offered different visions for how we might build an even more vibrant Wellington: the importance of economic development; focusing on attracting talent, particularly in the creative and artistic segments; the role of social responsibility; and of sustainability and diversity. Each is important; with different dynamics and priorities. This session will illuminate synergies and trade-offs. The Forum closed with a summary of the discussions during the day and the challenges ahead. The shape of Wellington and the region is for us to influence, so come, learn and contribute. Original generation time 1.0045 seconds. Cache Loaded in: 0.0382 seconds.